The 3DS Direct carried a lot of big surprises with it, one of which was the confirmation of a new Pikmin game for 3DS. Word's been floating around for a while about there being a Pikmin 4 on the way, and – unless there's another Pikmin in development – it seems likely that this is what Miyamoto was talking about. The new Pikmin game will be the first portable entry in the series and will eschew the standard 3D approach for 2D action. Pikmin can be thrown by tapping on the touch screen, and the original three Pikmin are confirmed to be in the game so far. Also, it was said that this new Pikmin game is being designed with more action in mind; it'll be interesting to see how the gameplay differs then from the previous three entries. It's simply been given the tentative name of Pikmin for now, and releases some time in 2017. I don't think the Chibi-Robo treatment is the right idea, I have a lot of doubts about this. It looks decent... But I really hope this isn't what Miyamoto meant when he talked about Pikmin 4. @RupeeClock At least this actually has Pikmin gameplay translated to 2D, instead of Chibi-Robo's just make up something new. I will admit that the side view is not what I would have wanted in a Pikmin game, but I trust Nintendo to make it work. wait new 3ds games will be still coming to 3DS !! even during 2017 ? ...i thought they will replace 3DS anytime soon ... isn't it too old now ? it will be 6 years old device by then !! Looks like a good game, but 3DS swan song anyone? I sure hope there is another Pikmin game in development for a home console. Why do they have to turn everything into a damn 2D sidecroller? Very unexpected! Looks like another solid Pikmin experience from Miyamoto and Nintendo. I would not worry too much about Pikmin 4. It was stated several times that a 3D Pikmin game on 3DS would not work, notably because of resolution. And they don't want to dev' any new game on Wii U, so this makes sense. Nintendo's obsession with 2d side scrolling games is ridiculous. It's long past time to move on from 2D. I always encourage new approaches to old series: sometimes it doesn't work out, but it's better than just sequalising. I think Pikmin 4 is still an NX project, since this did not get that name. Highlight of the day for me. Looks very interesting, even with the change in perspective (3D to 2D). Doubt since neither this, Ever Oasis, Dragon Quest 8 or Mario Sports have a firm release date yet. This proves that the 3DS will still be around after the NX launches. I can't wait to play this game. @Samurai_Goroh @RupeeClock Agreed completely. It looks decent and all, but I definitely prefer and 3D Pikmin rather in a 2D plain. I'm the biggest Pikmin fan you're likely to find. And I think this game looks super unfun, and contains literally none of what I like about Pikmin. I am quite stoked for this. I'd love a Pikmin adventure on the go. That said, I really hope this wasn't "Pikmin 4." Pikmin is still best on home console, but I like this spinoff idea. I loved Pikmin 1 and 2, but the series grew stale so quickly. Not really interested I must say. It looks like a (relatively) low budget knockoff. This is definitely not Pikmin 4. Will probably be a 6/10 game like Chibi-Robo was. @Yasume I think it will be better but hardly a real pikmin experience. I'm not sure about this one, feels too much like an original DS that they just forgot to release! I'm not usually a pessimist, but I'm not too sure about this. I mean, I'm sure it will be a decent game, but I don't have any interest in a 2D Pikmin. Maybe I'll be convinced when more is shown. The first thing I thought was that it looked a lot like Chibi-Robo! Zip Lash but it looks like they translated the Pikmin gameplay pretty well for a handheld. They couldn't really make a normal Pikmin game for 3DS due to the small screen size. I'll wait and see how this turns out. Honestly, I am very sick of 2D side scrollers. But hey, I'll still give this a fair chance even though this better not be the title Miyamoto called Pikmin 4. Sure hope we get some Pikmin amiibo, too! If this was Pikmin 4, I'm sure they'd have said it was that game. No reason for a "Pikmin: working title" type thing in that case. I think Pikmin 4 is an NX project. I think, or hope, that Pikmin 4 does exist, too. This one doesn't mean that Pikmin 4 doesn't exist. They can both function alongside themselves. I'm actually glad that this one is different. It's kind of like a spin-off. Let's leave the main titles on consoles. SO pumped for this!! It's Pikmin!!! No, not exactly a traditional Pikmin but looks great and I absolutely NEED this. Huge Pikmin fan here! Cannot wait for this! That's exactly what I thought as well. For some reason, people didn't really seem to like Mass Attack (especially from what I've seen on this site), but I really enjoyed the chaos of it. Looks like more of Action Puzzle game to me than a main Pikmin. still..... the controller cluster mess of Pikmin3 turned me off and never played much of it, even though i got it free. Pikmin 1 with gamecube controls is one of my favorite games, ever though. I highly doubt that this is Pikmin 4. This is a spinoff title. Pikmin 4 is said to be complete and will more than likely be an NX title. @Pikmin22 I was just about to post it's kind of a re-skinned Kirby Mass Attack, which I always assumed was a re-skinned Pikmin game. If this is Pikmin 4 then I don't need to buy an NX. And I'm really annoyed about it. I didn't mind them keeping Pikmin 4 off Wii U for NX b/c they need to sell a new console, but putting it on the older 3DS instead is mean. And when you put a Mario Sports Mix sequel on 3DS rather than Wii U, which never got a baseball or soccer Mario game. Man, it's 1 thing to abandon Wii U for NX, but to abandon it for the older less powered handheld? That's just really mean. So, is NX a home console to be abandoned or a handheld where all of the games like Super Mario Maker and Yoshida Wooly World are going to wind up anyway? Could go either way still. Abandoning Wii U is fine if they are going to move all its games to next gen, but to abandon it and move all its games to last gen, that ain't right. @MoonKnight7 @Pikmin22 I think of this game as what 2D Metroid games are to 3D Metroid games. And for some reason it sounds like Nintendo has nailed the 2D gameplay of Pikmin for the 3DS. I'm optimistic about this title! This announcement was definitely one of the highlights for me. It reminds me of The Lost Vikings game on SNES/Genesis for some reason. Maybe the puzzle like action? A fantastic surprise, that's for sure. I can't wait to play this one; it looks like it'll be a lot of fun! Nintendo: lovers of 2d only games. Well-well-well... A 3DS game I actually can't wait to get. ...tell a lie I want Dragon Quest VII too, but in the 3DS' life span, I've barely got as many games for it in the same amount of time I had for the regular DS. I wonder if this is using the Chibi Robot 2D game engine to some degree? @msvt Did you play it with the wiimote + nunchuck? It's the best control scheme I've ever used in a console RTS game. I actually did not try (I know i know! not fair of me)... reason being, I played the New Play Control versions of 1 and 2 and did not have as much fun (it is uncomfortable for me) as with the GC controls. I will give it another go at some point with the Wiimote combo but it is still a bit cumbersome to have the gamepad on the stand and get all the game area set with multiple controllers and sometimes I just want to turn it on and play for a few minutes. Know what I mean? I liked Olimar Pikmin (one main) better than the constant switching too. A few sections with a second character would be ok but Pikmin went in a direction that added more frustration for me -though I am on of the few that loved the timer on the first game (love that game overall). Looks a bit like that latest Chibi Robo... that wasn´t a very interesting game. I was hoping for an NX Pikmin 4. Makes a bit worried about it´s launch window. This was one of the rumoured titles I was sure would be on the NX. But hey, I could be wrong and they´re actually making a Pikmin game for NX too. I didn´t know you were in Nintendolife! Are you going to make a video about first impressions of Pikmin 3DS? Looks reall charming. Will most likely pick this one up. This one is obviouly different from the home console versions but it seems to keep the spirit of the originals. I am impressed. 2d platformer or 2d like legend of zelda? Apparently, this game is being developed by the same team that developed Yoshi's New Island. So no, this is definitely not Pikmin 4. This is looks amazing. I am surprised at this one. I will get it. I love me some Pikmin. This 2D side scrolling puzzler is right up my ally. @Pluto14 I'm afraid it looks like it as article says.There's only one pikmin. @rjejr Pikmin 3 never sold well on Wii U,it has to be profitable and it seems on home consoles it's not.Maybe on 3DS it will be good game and sell lot better.Take metroid prime games they only sold about 1 mill and compared to work that when into it that's not a lot. My favorite of the direct. Pikmin on 3DS seems like a good spin-off idea... like Lemmings or something. So, Kirby Mass Attack but with Pikmin? Heck yeah! @msvt Having to keep the gamepad on and close was the only thing I didn't like about the wiimote combo. Other than that, it's a really great control scheme and you should definitely try it! Talking about the game itself, I think it's anything but frustrating. Without a doubt, one of my favorite Wii U games. Hey friend! It is confusing; if the WiiU had been at least as successful as the 3DS then many of these titles would most likely have been cross-platform releases to begin with. As it was Nintendo did what it had to in order to differentiate the struggling WiiU with exclusives. Now with that strategy largely obsolete it does make sense to port games and create original content within winning franchises over to the larger install base that may have missed out on certain things. I think you can put aside worry about this being Pikmin's new direction by the way. It's clearly an offshoot. That being said, this move also illuminates the practicality of consolidating handheld and console development while at the same time casting doubt on the rumor that the NX is a hybrid. Why would they spend all of this effort on the current handheld during months that will reportedly overlap with the release of a brand new handheld? Perhaps it makes sense to support existing income streams at a time when the release slate has been largely stagnant and during a quarter marked primarily by the uncertainty of a major console unveiling. I think a lot of these NX rumors make sense especially with regard to development consolidation, but I also don't understand why no one mentions the disparity between Nintendo's claims that the NX will be a driven by a novel concept and the Eurogamer description which is conceptually, essentially an upgraded WiiU; only now you can walk out of the house with the gamepad. The games will be larger and the graphics upgraded but the concept is unavoidably an outgrowth of the WiiU. This may line up with certain business moves within the company but not with their own assertions. Additionally, I keep hearing talk within the Nintendo community of this being successful as another accompanying system but it is a small segment of the market that owns more than one console. Maybe they can push a paradigm shift but I'm basically waiting on the reveal to decide between an NX or finally getting a PS4. If everyone had the time and money to invest in every system then it wouldn't be an issue. It is possible that I may fall outside of Nintendo's target audience in both hardware and software for the first time. I love Nintendo and hardware innovation in general and I love my 3DS (and the WiiU I bought for my brother but never pulled the trigger on for myself) but the bottom line is I want to play some of the third party games I've been missing. Doubt that this game uses 3D, the main action of the game is on the lower touchscreen. First Federation Force, now this. Great. I bet this is the "Pikmin 4" game that we all assumed was going to NX, and I bet it was intended for 3DS all along. NX will eventually get a real Pikmin game. It's not the first time that Ninty and Shigsy's comments about Pikmin have been suspect. Remember when Pikmin 3 was announced after the E3 2008 press conference and we didn't see anything from it for years? Funny that. I like it! I doubt this is Pikmin 4, if it was then it would have been called that in the direct. I wonder if Miyamoto is directing this one? I dunno about this... it really depends. The best case scenario is that someone at Nintendo really had a good idea, and Miyamoto thought that the Pikmin branding was the best option. I can see this as having some really cool puzzle elements in it if done right. Heck, maybe they could kinda merge the RTS and side-scrolling genres into one (unlikely, I know)! But if this was just the result of someone at Nintendo who said "let's just make Pikmin a side-scrolling platformer because why not?" then this game will likely be uninspired, like Yoshi's New Island or Chibi Robo zip-lash. @123akis, I agree that we weren't really due for a full new 3D Pikmin game. Pikmin 3 is by no means outdated. It seems interesting, I don't think Nintendo would fail with this title, but I'm on the fence, waiting for reviews first. @rjejr @MitchVogel I heard it's from the same team that did that Yoshi game (not the new woolly one) for 3DS. That means this isn't by one of the EAD ''Pikmin'' teams; that should also mean that Pikmin 4 is still it's own thing coming to Wii UNX. @blinder2 What do you mean it didn't sell? As a dormant series it managed to break 1 million on the Wii U; despite the fact that Nintendo kept stock low and the price at $60. Its attach rate was better than the GameCube games. @Octane "That means this isn't by one of the EAD ''Pikmin'' teams; that should also mean that Pikmin 4 is still it's own thing coming to Wii UNX." Thank you kindly sir, I needed that. @Mainsaile I'm not mad about the ports, I'm happy for the ports of SMM and Yoshi. That's not sarcasm, its the truth. More money for Ntinedo, more fun for mobile gamers, I've played those games enough along time ago, I'm not one to get upset about "exclusivity", Im fine w/ multiplatform games. I am mad about Pikmin and Mario Sports. We purchased a lot of Mario sports games on Wii and bought a Wii U expecting at least a couple of HD Mario sports games. So while it may make sense for Nintedo to make them on 3DS rather than Wii U, that doesn' tmean I can't be upset about it. And stupid Nintnedo could have made things better if they had only shown us NX and some of it's games by now. If Wii U owners can buy a new NX and get Pikmin 4 bc/ this is just an offshoot, that's great, but we dont' know, Ntineod keeps everything to close to the vest, it drives everybody crazy. If this isn't Pikmin 4, Pikmin 4 is on NX then just tell us. We know Zelda is on NX, we know DQ is on NX. We know Just Dance is on NX. We know Sonic 2017 is on NX. So tell us, is Pikmin 4 on NX or is this 3DS game Pikmin 4? Enough is enough w/ the secrecy, unveil NX. Or at least Pikmin 4. Hopefully we get another main Pikmin for NX, but a spin-off might be the best fit for the less powerful 3DS. If it gets good reviews and the gameplay sounds good, then I'll be happy to get it. @rjejr Mario multiplayer games (like Smash Bros and Mario Kart 8) sold well on the WiiU. I don't know why Nintendo didn't invest in a Mario Strikers, Golf etc. @Chandlero I'd guess Sports Club sold poorly so it turned them off sports. Of course it deserved to sell poorly, 100mil Wii owners already had it, and Wii Sports came free with their Wii, and Ntineod was selling each "sport" for $10. Why would anybody spend $10 each for 5 sports they already had? They stopped free preview weekends after not too long and I dare you to try and find it on the Wii U eShop w/o doing a search. It did get a disc release but I don't recall seeing it in stores. Should have been a "Select" 2 years ago. But anyway, I'm guessing Sports clubs failure contributed to the "no sports on Wii U " decision. Not the only reason, but a contributing factor. @blinder2 What @Octane said. 1 million on an install base of only 13mil Wii U isn't bad. @enphos The GBA was still supported a good few years after the DS was released and same with the DS when 3DS came out (Pokemon Black and White anyone? That one year when Frozen on DS was the best selling game on any Nintendo system that year? XD). The 3DS will get support for a good number of years after the NX release. Honestly this isn't what I had in mind for a new Pikmin but I'm sure it'll be good. I think this is a spinoff and not the actual Pikmin 4. 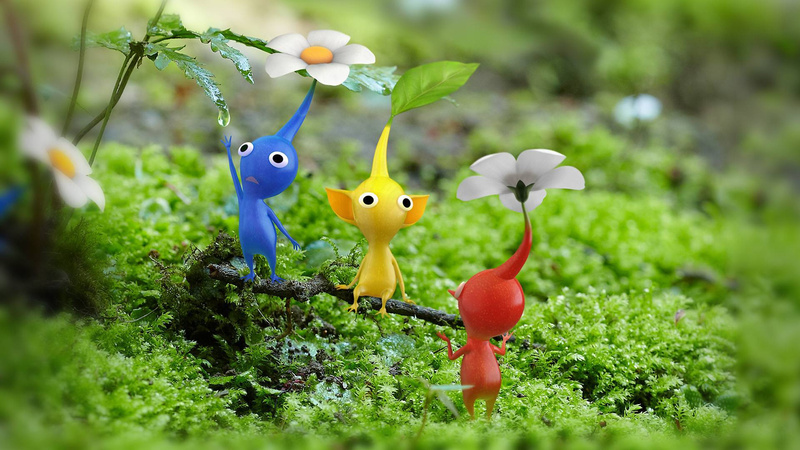 Pikmin 4 will be on the NX and this will be something less story driven, maybe non-canon. Not to be a downer but....don't we have enough 2D platformers/side scrollers from Nintendo? Mario and Kirby fill the void more then enough, now we've giving Pikmin one? I'm sure it'll be a good game none the less, but still. The gameplay looked slow in the trailer. Hopefully it'll have a faster pace and more action once you get further in the game, but I'm still cautious about this game. This would be ideal for smartphones since it can be played almost exclusively using the touch screen. Not sure why they made this a 3DS game instead. Really hoping that this isn't Pikmin 4 as well. I'll still check it out as more information is released about it, but I really love the RTS gameplay that Pikmin offers. It sounds like this game is going to lack that and be more ChibiRobo style. But more bad news, it looks like if there IS a Pikmin 4 in development, it means it's probably not going to be an NX release with this 3DS Pikmin coming in 2017. Pikmin NX is basically the only reason I would think about getting an NX next year, no matter what the specs were of it. Without that release, I'll probably end up getting one in 2018 or for christmas 2017 at the earliest. @Angelic_Lapras_King Nintendo changing thinkings up? NAH! MORE SIDE SCROLLERS! Why? Because they're easier and cheaper to make than 3D platformers. There is no way this is Pikmin 4. This looks like a spinoff and the fact that Nintendo didn't name the game (see the end of the trailer), Pikmin 4 right off the bat, but rather said it's, "Pikmin for Nintendo 3DS (name not final)" So I think this was a little treat that Nintendo is probably been working on to give the 3DS a major 1st party swan song. Also it might help Nintendo fight off pressure to release Pikmin 4 in 2017 on the NX, and release it when it's ready in 2018. Now all that being said, I'll go into this with some skepticism, but it looks pretty solid for an early build and if they work hard to keep the Pikmin sprit alive, I'll grab this one next summer. If this is Pikmin 4 I am going to be enraged. Why did Nintendo think it was a good idea to give Pikmin the Chibi-Robo treatment? From what I saw in the trailer this game looks bland, boring, and just not fun, plus the graphics don't even look that great AND THIS IS A PIKMIN GAME FOR CRYING OUT LOUD. @crimsontadpoles Well, that's the thing though. Pikmin is rarely fast paced; you're either just exploring the world and grabbing new Pikmin... or just grabbing new fruit. It's probably fast paced with boss battles but I think that's it. Trinen did mention that Pikmin 3DS is developed with action in mind, so maybe we'll be getting a lot of fast-paced action. @arlo If your videos on Paper Mario are anything to go by, I would be eagerly awaiting some type of overview on Pikmin! Pikmin 3.5 for 3DS ? To me it sounds Pikmin goes the Chibi Robo way, wich is exactly what NOBODY wants!! Also, if this turns out to be Pikmin 4, many will cry! I dunno, the touch-screeniness of this makes me think it would have been better released as a mobile phone title. The game looks quite decent, seems like an interesting solution to the problem that a Pikmin game would have in a 3DS, screen size and resolution. I could imagine a standard Pikmin would make the Pikmin appear a handful of pixels on the 3DS screen. I'm guessing by focusing on "action" it may be more puzzle solving and battling enemies. Although the trophy in the trailer means there's still an item collection aspect. I'll definitely give it a shot, although I'm looking forward to Pikmin 4 more than this but this one might be an interesting take on the mechanics into a 2D perspective. @Arlo Oh good grief...what an exaggeration. Yeah you're clearly a big fan of Pikmin by making a statement that makes it look like you'd dislike Olimar and the Pikmin themselves soley to put down this game. As long this isn't hte 'Pikmin 4' Miyomoto, I'm fine with the franchise going into spinoff territory.